I can’t say that i had the highest expectations of this story – but i think that i was kind of hoping for more. 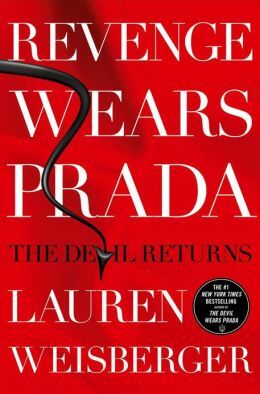 I really enjoyed Devil Wears Prada and the movie was a decent interpretation. The problem now though is that since i’ve seen the movie endless number of times, those are the images that i have in my head and that means that all of the characters in this sequel have to be the actresses/actors and that’s just not right! So let’s just start with the overview of this story – granted i know that they write things to lure you in, but what you get in the first handful of chapters jive with this but the whole story isn’t necessarily based on it all. I was expecting a bit more drama in a few places and we didn’t get that. What we DO get is a new found friendship between Emily and Andy which is nice. They had a hate hate relationship back in the runway days, but after re-meeting at a cooking class, being paired together and realizing that it’s not because of themselves that they hate each other, the start to bond. It’s a nice thing for andy given that she’s alone (single since the breakup with Alex), her best friend Lily just moved to Colorado and her parents are getting divorced. Emily is just what the doctor ordered. Also, we see that Andy is quite strong on her own and we get this throughout the book. After giving Miranda the big ‘F U’, she’s managed to land on her feet professionally and parlay that into something great and amazing both on her own and with the help of Emily. So, as I was reading this story, there were things that i knew that were going to happen, things that i kind of hoped wouldn’t happen, and a thing or 2 that i was actually a little bit surprised about. 1) How does Miranda fit into everything and is she as bad as we remember, or worse? 2) how strong is Andy and Emily’s friendship really? 3) What’s going to happen with Andy and Max? so….an average 3 out of 5 stars i’d have to say…not bad but not amazing. Happy Reading! This entry was posted in Reviews, Young Adult and tagged Devil Wears Prada, Lauren Weisberger, Revenge Wears Prada, YA lit by iscm13. Bookmark the permalink.